The morning dawned overcast, muggy and wet with intermittent showers. But with a pre-dawn high tide, terrapins could be expected. So, a little after 5 am, Turtle Journal’s Sue Wieber Nourse and Rufus the Turtle Dog headed into the darkness in search of nesting turtles. As the clock ticked toward 6, Sue discovered this beautiful large female on an unsuccessful nesting run at Aucoot Cove. Nearly 20 centimters long and weighing 1343 grams, this terrapin (now #321) had not been previously seen. She still had eggs inside her, but they were fairly high in the oviducts. So, she will have several more opportunities to make a successful nesting run. 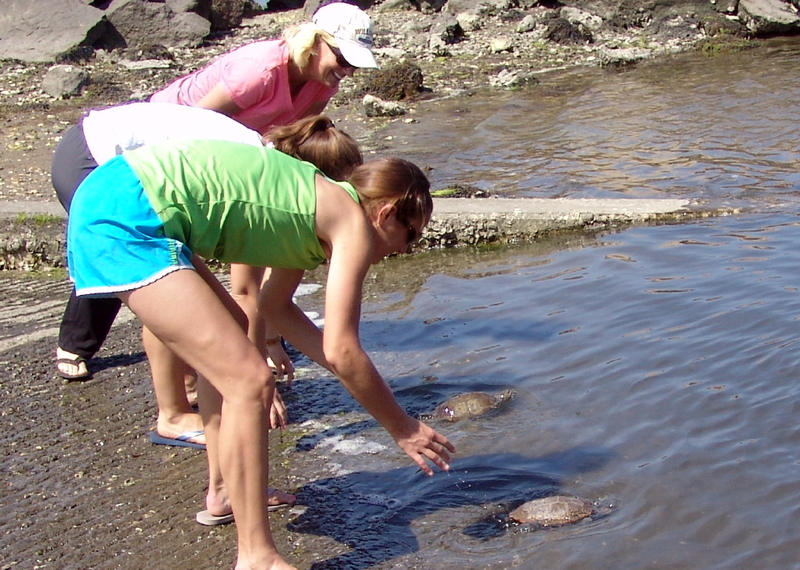 At Hammett’s Cove on the other side of the town, Sue and Terrapin #316 surprised each other. This less than optimal nesting site has been dramatically disturbed by human development. Once a dense terrapin nesting site, it offers little hope any more for a viable nest. Terrapin #316 had crossed the now compacted and gravel pathway, which had previously served as a perfect nesting location, and found a tiny spot of root-filled soil near a pile of rocks protecting the private dock. With little hope that these eggs would survive predators or avoid root invasion, Sue excavated twelve perfect terrapin eggs, weighing a total of 91 grams. 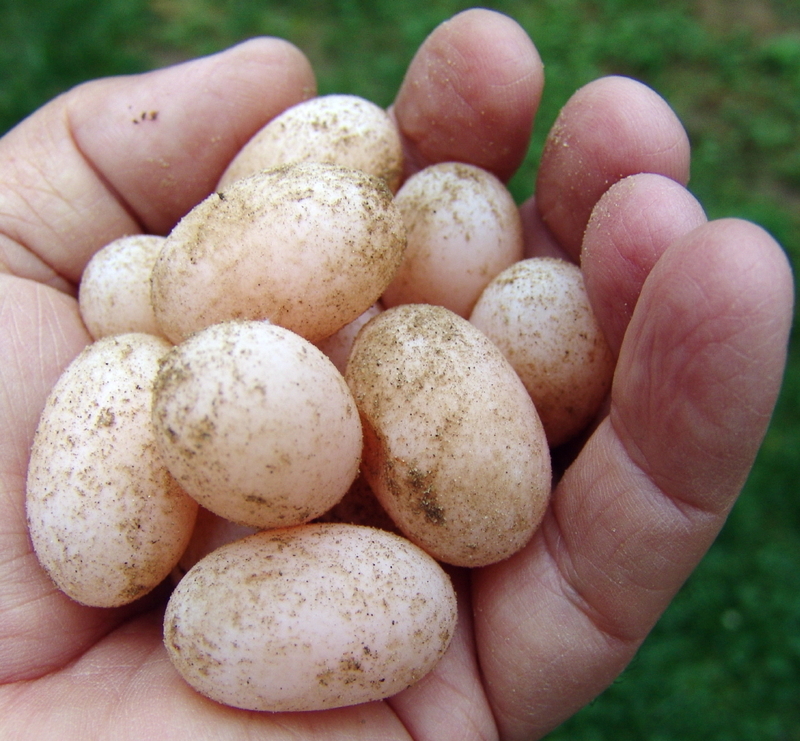 Each egg averaged between 3.2 and 3.3 centimeters long and weighed about 7.8 grams. 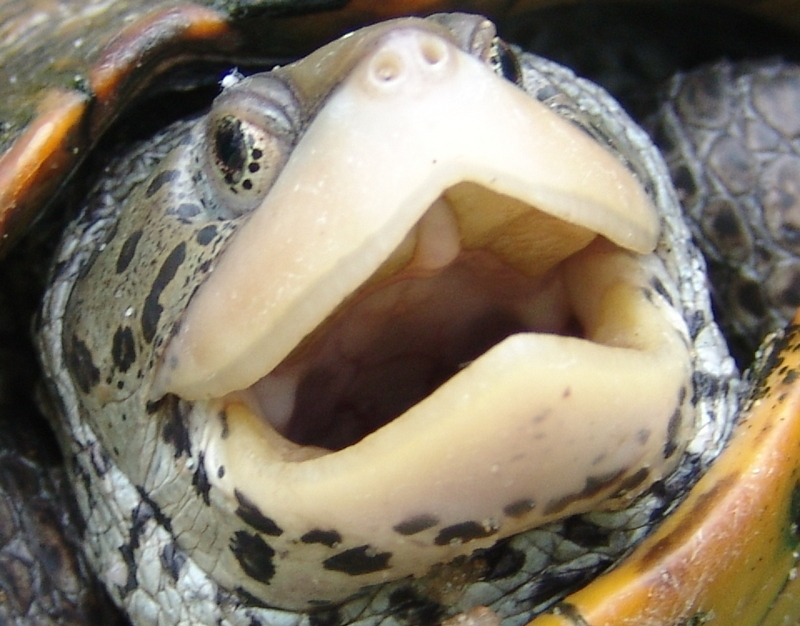 We had seen Terrapin #316 nesting at Hammett’s Cove in 2010. Back then, she had laid her first nest on June 9th. Today’s nest is a full ten days early. We gave her eggs a “helping hand.” Her nest has been relocated to a safe “turtle garden” where Terrapin #316′s babies can incubate in safety until they hatch … perhaps as early as the end of July. Diamondback terrapins began nesting on the SouthCoast of Massachusetts today on the afternoon high tide. 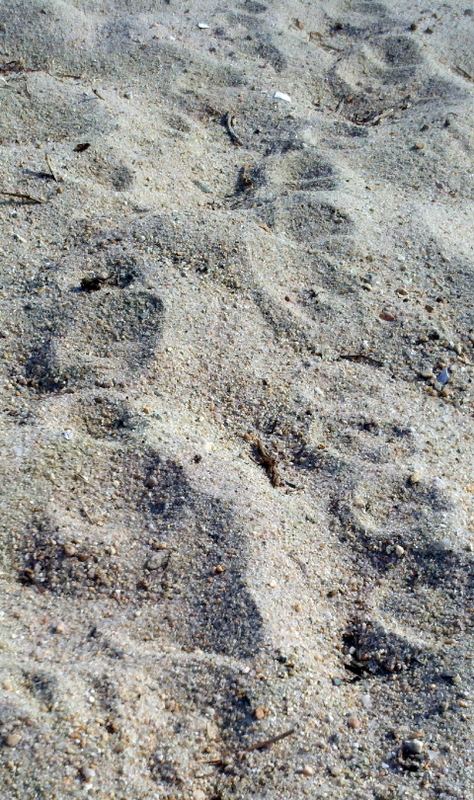 The Turtle Journal team scoured the Aucoot Cove barrier beach this morning for signs of terrapin nesting, such as tracks. Nothing was found. Yet, shortly after the PM high tide, we searched again and discovered tracks from two separate nesting runs … including several false nests. We also received a report from Broadmoor Marsh in Wareham that a female terrapin had been observed returning to the bay after a nesting run. 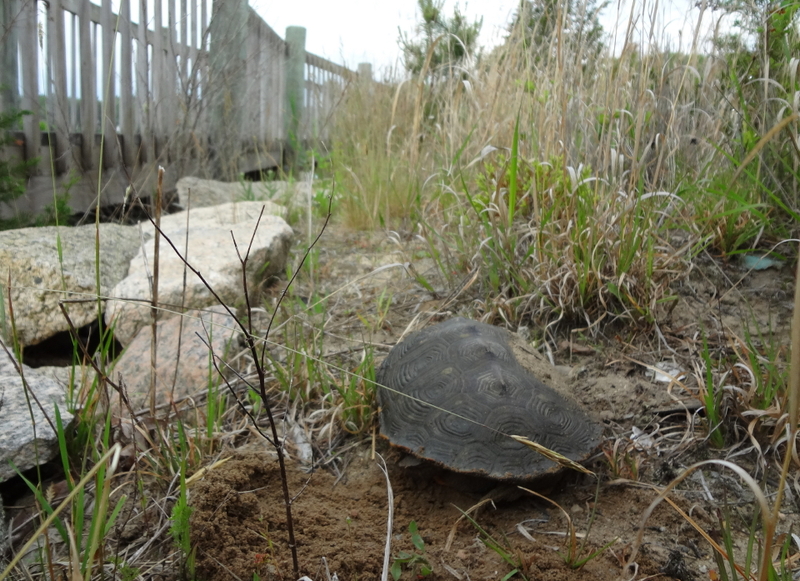 Today’s start date is a full week earlier than last year’s start of the terrapin nesting season. Within the last 24 hours, Turtle Journal found three freshly laid snapper nests. On Sunday, we followed snapper tracks to a large disturbed sandy area, roughly smoothed over. Careful excavation revealed 49 ping-pong shaped eggs. This morning, we discovered two additional snapping turtle nests. One held 21 intact eggs (see above) that averaged 11.8 grams weight a piece. Four additonal eggs had been broken by the mother as she tried to tuck them tightly into this steeply inclined nest. 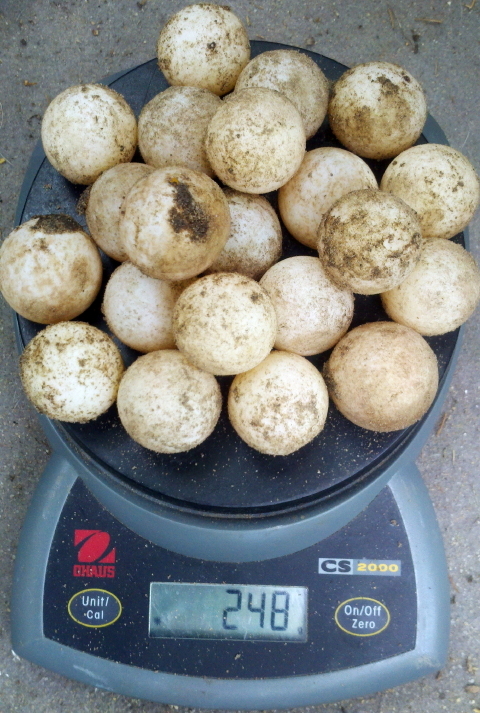 The other nest held 29 perfectly shaped snapper eggs for a total of 99 snappers-in-waiting. 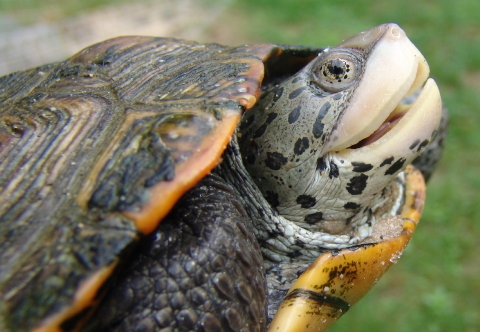 Painted turtles have been nesting on the SouthCoast for almost two weeks and they continue to do so. 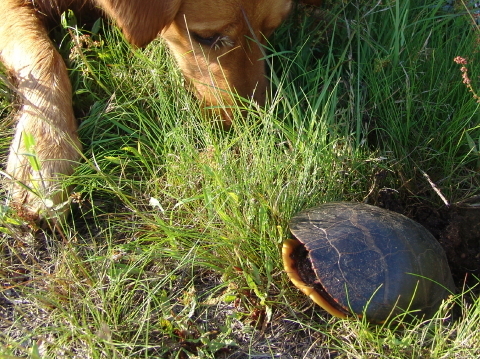 And Rufus the Turtle Dog continues to find female painteds as they secretly and quietly tuck eggs into the ground. Over the weekend, Rufus alerted us to three more nesting painted turtles. 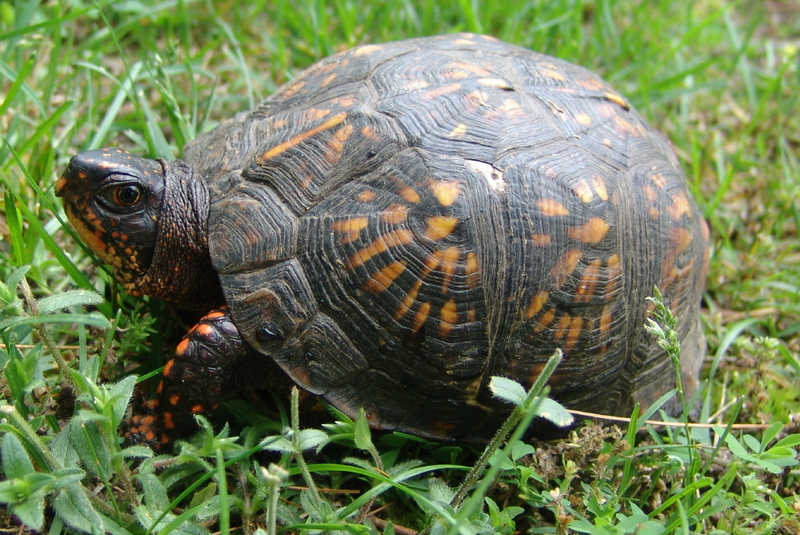 On Saturday, during our local patrols, Turtle Journal found a female Eastern box turtle on a nesting run off Converse Road in Marion. This beauty hit the scales at a whopping 649 grams. After her release she played peek-a-boo with the camera before disappearing into the underbrush. Spotted Turtle Aggregation — How Many Can You Spot? Later than we usually observe, spotted turtles remain active in aggregation sites on the SouthCoast. Turtle Journal discovered a new spotted turtle location this spring and has been following its activity for several weeks. We have counted at least 20 spotted turtles ranging from tiny yearlings to mating adults basking in this dense swampland. 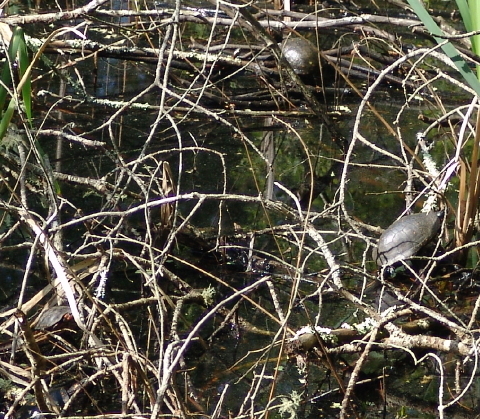 How many basking spotted turtles can you find in the picture above. Click on the image for an enlargement. Hint: Two is too few and three is never crowded enough. Turtle Journal has monitored the Great Blue Heron rookery in Marion on the SouthCoast of Massachusetts since early April. 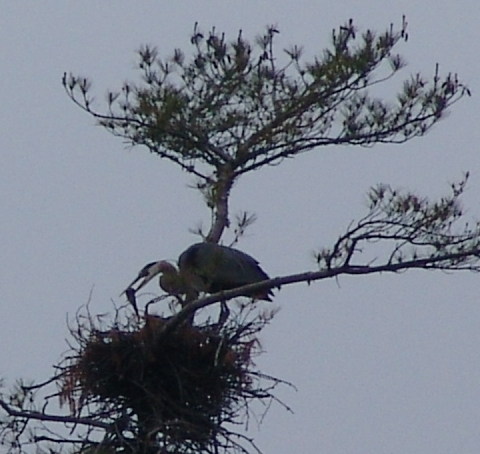 See Great Blue Heron Rookery on Massachusetts South Coast. 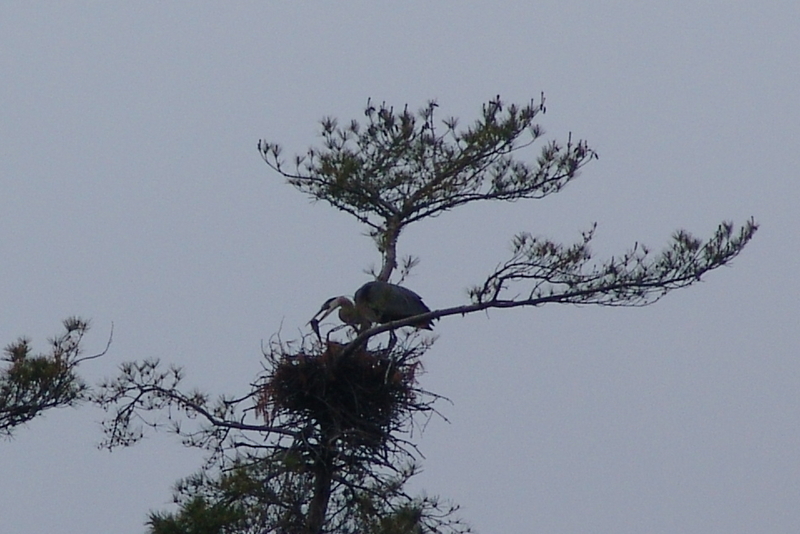 This afternoon, in relentless rain and dense mist, Sue Wieber Nourse spotted hatched chicks in two adjacent heron nests. The babies were noisy and demanding; the adults patient and providing. 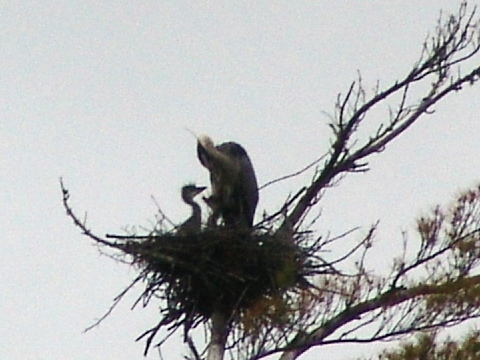 After a period of intense feeding, the chicks settled down for a bit and the adults spent a few moments grooming. 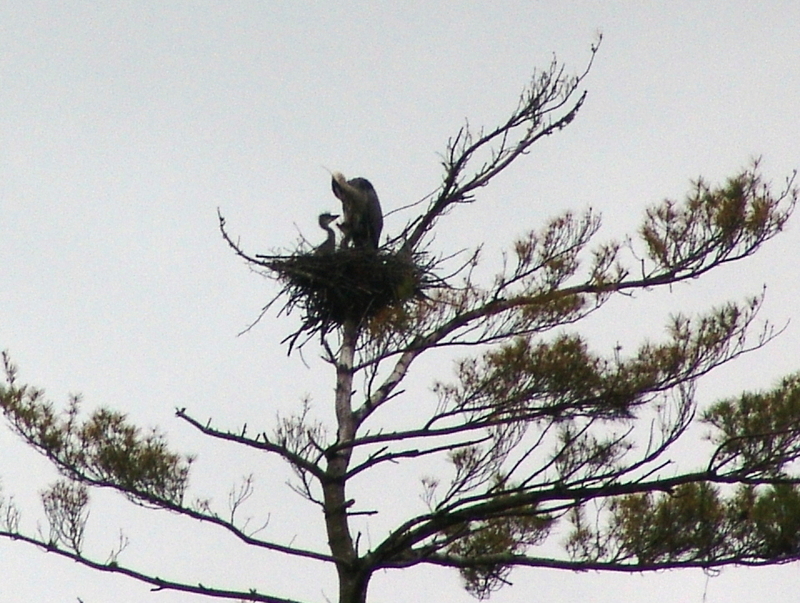 But with insistent babies in the nest, nothing lasts for long and the chicks soon were pleading again for attention. While Don acknowledges that his video is a bit shaky due to extreme distance from the nest and terrible weather conditions, the clip does provide a good sense of the chicks’ early days. As Turtle Journal observed these two nests today, we discovered that the adult would occasionally offer small fish to the chicks by waving it from its beak and then laying it next to the babies in the nest. The team will continue to monitor these hatchlings in the days ahead … hopefully under some bright sunshine for a better set of documentary pictures and clips. This weekend the Turtle Journal team recorded the fourth Eastern box turtle at Mass Audubon’s Great Neck Sanctuary in Wareham, Massachusetts. 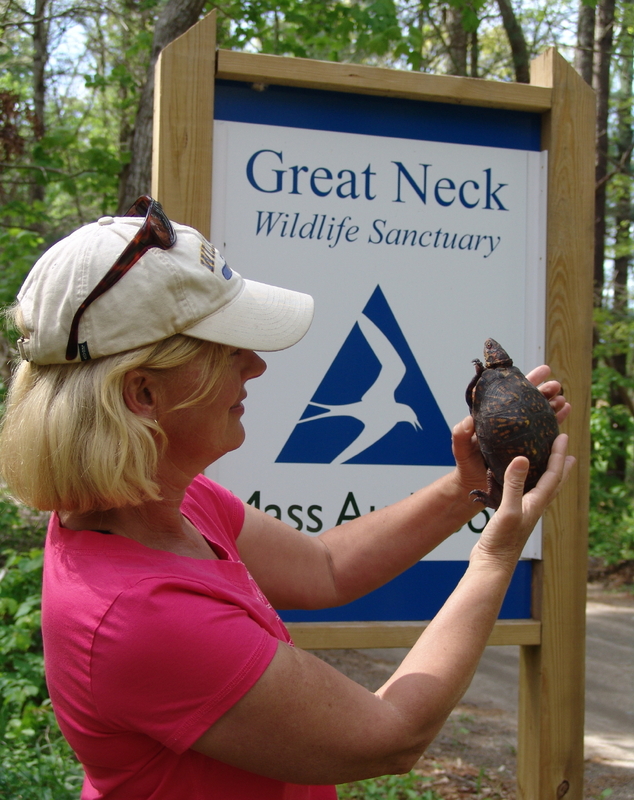 Above, Sue Wieber Nourse examines this very attractive male box turtle in front of the Great Neck sign. 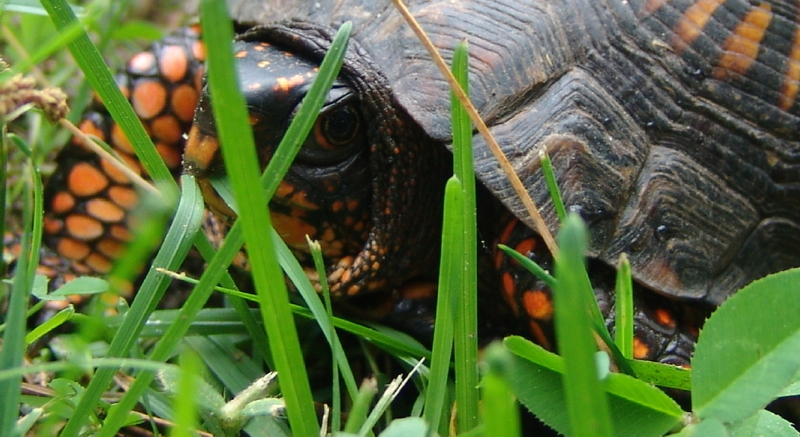 Incredibly handsome, this male box turtle sports bright red eyes surrounded by deep orange skin with a tinge of yellow in his cowl. His carapace is quite dark with golden highlights. This fellow is marked #3 for future identification. 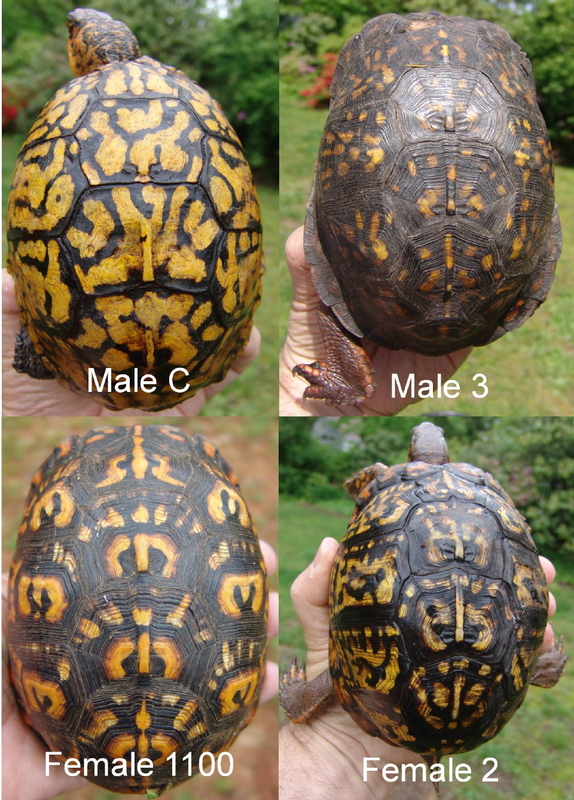 Since its opening last summer, we have identified four Eastern box turtles within the Great Neck Sanctuary. Two, #2 and #1100, are females; two, #3 and C, are males. All are mature adults. No juveniles or hatchlings have yet to be found. 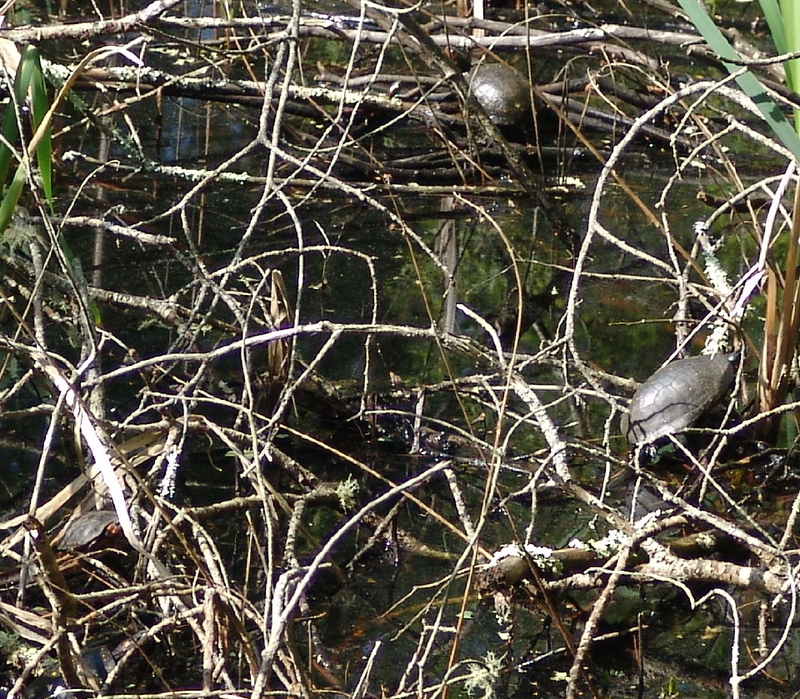 Click on the image above for an enlarged photograph of these turtles for easy identification. If you encounter a box turtle during your walk along the trails of the Great Neck Sanctuary, don’t hesitate to call the Turtle Journal hotline at 508-274-5108 or email us at theturtleguy@comcast.net. 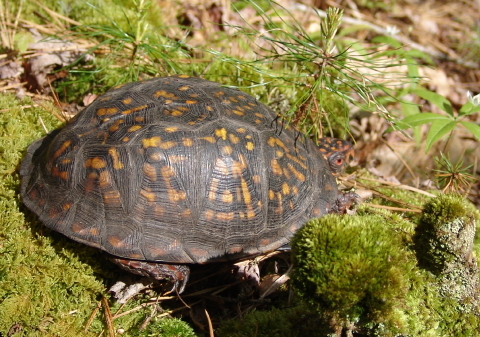 After an examination, a complete set of measurements, and after being marked with a triangular notch in his third right marginal scute for lifelong identification, this male Eastern box turtle was released deep inside the Huckleberry Loop of the Great Neck Wildlife Sanctuary. Keep a sharp eye out for him and his companions when you’re hiking through Wareham. At noon on Sunday, Sue Wieber Nourse netted two large female diamondback terrapins in Buzzards Bay’s Sippican Habor. 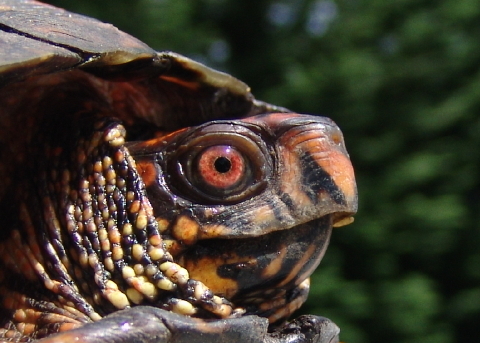 Both turtles had previously been captured by the Turtle Journal team and had been under study since 2005. 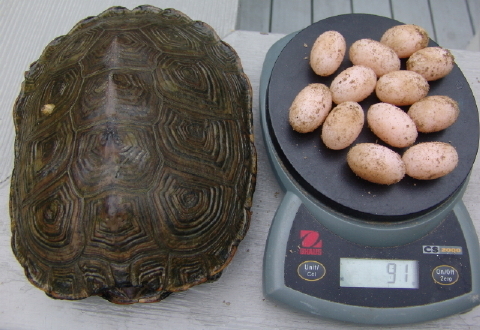 Terrapin #284, measuring nearly 21 centimeters long and weighing 1538 grams, was palpably gravid. Eggs could be detected still fairly high in the duct. Terrapins #79, measuring a little over 20 centimeters and weighing 1492 grams, was not papably gravid. 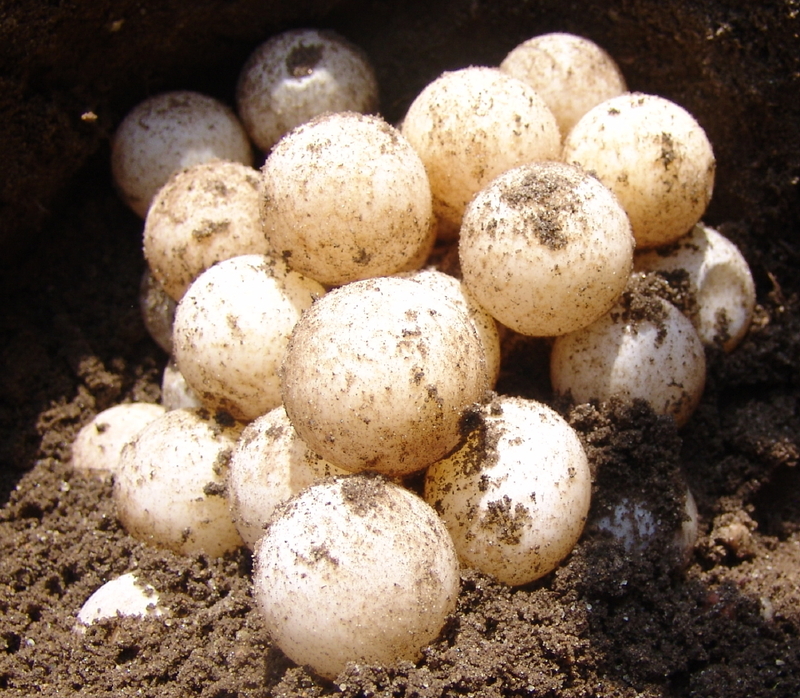 With detection of eggs in the oviduct, we anticpate nesting to commence on the SouthCoast within 15 to 18 days. You are currently browsing the Turtle Journal blog archives for May, 2012.